The Ink Trap: Art Impressions at Simon Says Stamp! Hey, all! Back today with post number two! (Scroll down for the the first one.) This one also features a card I created using an Art Impressions image, but this time it's for Simon Says Stamp. Simon Says Stamps carries a boatload of Ai images in their shop! "Art Impression images lend themselves perfectly to lots of vibrant coloring. Whether your tools of choice are alcohol markers, watercolors, or pencils these whimsical characters just beg to have their personalities amped up with added hues. My color weapons of choice are Copic markers. 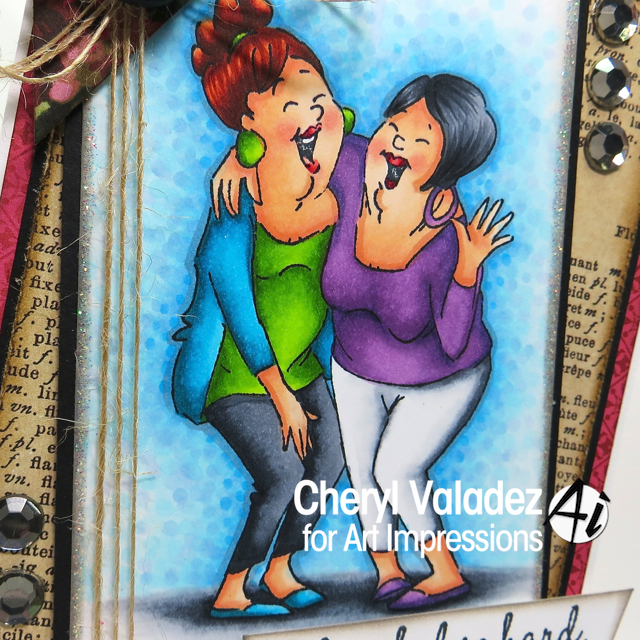 Using a standard A2 size (4 1/4” x 5 1/2”) layout, I kept my card simple and let this fabulous new Ai image, Laughing Girlfriends set, take center stage. Not only is the image wonderful, but the 3 sentiments included in the set are absolutely hilarious! My favorite, however, is “I laughed so hard, I had tears running down my legs!” I LOVE that! These two gals are having such a great time I reached for very bold and bright colors to reinforce their joy :)"
Awesome image and card.. Can't help smiling when I look at this. Saw this hilarious card on FB! What fun and your coloring is awesome! Great design too! I actually use that phrase all the time! Gorgeous coloring, and those two gals are having the best time! This set is a must have for me! Great job!